You Write it, We Tweet it. The American Association of Museums Annual Meeting and Museum Expo opens today in Minneapolis. With this national gathering of thousands of museum professionals in our backyard celebrating by officially launching the Analog Tweet project at AAM. The inspiration for this simple activity is mixing the tactile intimacy of the handwritten notes with the immediacy of social media. The intent is for people to share thoughtful messages through “slow tweets” which leave behind a physical object after they are sent into cyberspace. 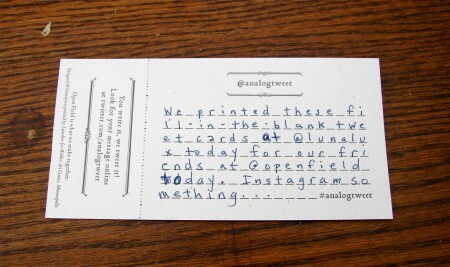 Here is how it works: We partnered with local print shop Lunalux to create telegram-like letterpressed cards. Each card contains metered spaces for the 128 characters (140 minus the #analogtweet hashtag). You are invited to compose your message, remove the perforated receipt, and we will tweet the message and include a picture of the physical card. It is actually hard to compose a tweet without the ability to have characters auto counted and writing it in one draft…don’t worry we have scratch paper! The tweets are visible at @analogtweet and on the Open Field Facebook Page. Please follow us to see all the compositions over the course of this week and summer. The analog tweet table is located at the hospitality lounge across from the Dunn Brothers Coffee Shop during the AAM conference from noon to 4pm each day. We will also be providing other AAM related activities during conference including Drawing Club Coloring Book sessions, Open Field Button Making and Museum Bingo. If you are not attending conference analog tweet will settle into their permanent home on the Walker Open Field all summer as a daily amenity.